Another adorable Pig tales figurine by George Good. Made of hand painted bisque porcelain, and is in excellent condition and original hang tag. This onr titled "I just love carry out". 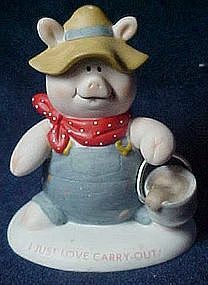 A farmer pig dressed in overalls and red kerchief and straw hat carries his slop bucket. Measures 4" tall.